Zeiss Terra ED binoculars, legendary quality at a super price? 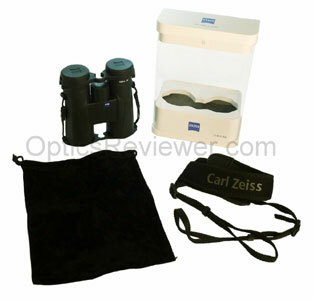 Zeiss Terra ED Binoculars. . . The Zeiss Terra ED binoculars and their pricing make it obvious that the company has changed its relationship with binocular users! It is no secret that their focus has been on premium quality with premium pricing for a number of years. The Terra binocular is evidence that the new president of Carl Zeiss Sport Optics, LLC, has been shaking things up and making changes in the company in the last couple of years! What is one company change that's evident in the new Terra ED? The price is probably the thing that captured everyone's attention when it was introduced. It's the most affordable binocular Zeiss has produced in a long time and represents a major change all by itself. It's no secret in the industry that the so&hyphen;called "alpha" binoculars are typically engineered for high performance first and then priced to allow the company to sell them at a reasonable price that will allow it to stay in business and develop newer and better instruments. The Terra's design approach was more in line with the traditional, non&hyphen;alpha binocular approach&colon; select the selling price for the finished product first and then engineer the best binocular your manufacturing process will allow you to sell at that price. So do you get a $2,500 "alpha" binocular quality for the deeply discounted price of about $350 when you buy a Terra binocular? Some we've heard from have seemed to expect that to be the case. Let's dig in and get our Terra ED review rolling to see what you do get…. For light weight without sacrificing strength, the Terra ED binocular's chassis is made of glass-reinforced polyamide. What's a "polyamide"? Examples of natural polyamides would be proteins like silk or wool. Examples of synthetic polyamides, however, would include the DuPont products nylon, Kevlar®, and Nomex®. The transportation industry uses about 35&percnt; of the polyamide production because of the products' extreme strength and durability. 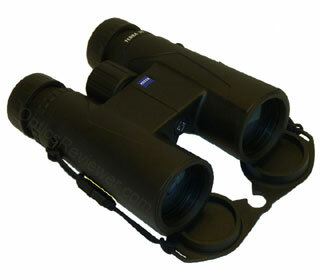 Binoculars using this type of material are light in weight, but durable. We expected the binocular to be well-balanced and not prone to "wobbling" when viewing for extended periods. We were not disappointed. Owners will enjoy the ability to use them for protracted viewing without excessive fatigue in the hands and forearms. "Thanks again and have a great day!" The Terra ED binocular's design and manufacturing process has it hermetically sealed after the air inside the instrument has been displaced by dry nitrogen gas. While this almost the norm with roof prism binoculars today, it's still nice to know that Zeiss isn't cutting a manufacturing corner in this respect and that your binocular is protected against internal fogging that often leads to fungal growth…that eats the glass surface coatings. Does "fog proof" mean that lenses will never fog up? No. It means that as long as the binocular remains sealed and filled with a dry gas that the inside lens surfaces won't fog. Of course, the externally exposed glass surfaces will still fog if you quickly move from a cool environment to a warm, humid one or if you breathe on them. On the Terra ED those external surfaces are also protected by the use of what Zeiss calls a "hydrophobic" coating which allows water to easily roll off those external glass surfaces. 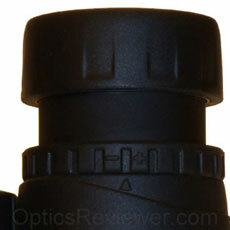 The eyecups on our test binocular had a stiff, solid turning action to raise and lower them. The stiffness of their rotation would seem to be a feature in this instance since the two intermediate level detents, or intermediate height steps, seemed a bit soft to us. We found that it could, on occasion, be difficult to quickly find the intermediate step of eye relief that we were looking for — however the stiffness of rotation compensated and allowed us to simply "get close" enough for comfort. The eyecups stay firmly in place when extended — we had no problem with them slipping down as is the case when eyecups are too loose. The eye relief of our test 8X42 configuration was excellent for eyeglass wearers at 18mm. It allows the eyeglass-wearing user to see the full field of view. The 10X42 configuration's 14mm eye relief should be adequate for most eyeglass wearers. If you know that you need a generous amount of eye relief for your circumstances, you may wish to find out what your minimum is before ordering a binocular. Zeiss has designed the diopter adjustment as a ring around the right barrel placed just ahead of the eyecup. It does not lock into place, as we prefer, but rather is engineered to move stiffly and thus hold the user's diopter setting. It's an approach which appears to work well for Zeiss and many others. The focus wheel of our test Zeiss Terra ED binocular was buttery smooth, without the any looseness or slack when changing the direction of focus. Although there wasn't significant resistance to the wheel, we had no trouble with the binocular "slipping out of focus" when we weren't actively using the focus wheel. One aspect of this binocular that the OpticsReviewer team loves is that Zeiss got it right in putting a gearing ratio that will move from close focus to infinity in a single, full revolution of the focus wheel. Why do we love this feature? It provides for a fine focus to see the details we're using the binocular to see, while not requiring excessive turning of the focus wheel to shift the focus between images or activity at varying lengths from the binocular. Many birdwatchers, hunters, sports enthusiasts, and plane spotters who have spent a significant amount of time with a faster or slower focusing binocular will attest to the value of this feature! It's worth acknowledging here that some people find that they prefer a slower focus with about 1.5 revolutions of the focus wheel from close focus to infinity. It's also worth noting that, while it can take a brief bit of practice with the faster focus if one's only experience has been with slower focus wheels, it usually takes very little practice before it feels natural and comfortable. One aspect of using the single-revolution focus wheel which some have noticed is that a person tends to stop at a well-focused point, rather than overshooting the sharp focus and having to "back up" to the sharp focus. When a binocular has a faster focus (close focus to infinity in less than a full revolution of the focus wheel), it is typically too fast to be of real use. The reason for this is because it becomes difficult to achieve a fine focus at that "speed" and the user will miss many desirable details that should have been visible, but were out of focus. A slower focus mechanism (more than a single revolution of the focus wheel from close focus to infinity), while not optimal to our way of thinking, is preferable to a faster focus. The slower focus will allow the user to achieve a fine focus and thus be able to observe the details not observable with less than a single revolution. The focus wheel of the Zeiss Terra ED binocular turns clockwise to adjust from from close focus to infinity. This is a point of interest for those who may have used binoculars long enough to have developed difficult-to-change focusing habits. Our regular readers will recall that we support the idea of using a tripod and tripod adapter with binoculars whenever it's reasonable to do so. Why is that? Glad you asked! While holding a binocular of 8X or 10X or greater up to the eyes, the hands unavoidably have a small amount of movement. The movement can spring from something as small as a person's normal breathing. That movement, however, will typically cause blurring of the image. It's enough to be meaningful if you're trying to see something distinctly and the color or detail is significant to your making a decision about what bird you've seen or if there really is a deer in the thicket you've been watching. Of course, the effect is magnified by the higher power binoculars. Perhaps you can imagine our disappointment when we learned that Zeiss had elected to not include a tripod mounting thread when designing the Terra ED binoculars. How to work around the lack of a tripod mounting thread? We use Nikon's Nikon Binoc-U-Mount Universal Tripod Adapter for binoculars and cross the straps to avoid having one cover the Terra ED's focus wheel. It's not perfect, but it works for us and a major benefit is that it works for more than just one make and model of binocular. If you have more than one binocular with one not having a mounting thread and you want a universal adapter, you may want to check out the Bino-U-Mount. "Designed by Zeiss" is written on the focus wheel of the Zeiss Terra ED. "China" is stamped into the body material beside the serial number and next to the underside of the hinge. We believe that the Terra ED is Zeiss' first significant foray into the manufacturing of products in China. It would be reasonable to expect a hiccup or two along the way in working with a manufacturing operation in a different country and culture and that Zeiss would be actively looking for feedback to improve its operation there. (Of course, minor variations in quality are to be expected in any manufactured product.) If a binocular were to slip through that didn't live up to the Zeiss reputation for quality, we would certainly give the company a chance to correct the situation! Before we leave the physical construction of the binocular, the build quality of the Terra ED binocular we tested favorably impressed the OpticsReviewer team. The fit and finish of the various aspects from the hinge to the focusing mechanism to the rubber armor all seemed to speak of care having gone into the binocular's design. Was it exceptional? Perhaps not exceptional at the Terra's price point, but worth noting inasmuch as this is Zeiss' first entry at the price. The physical build of a binocular is important to its usability and durability, but its optical build is where the magic of being able to see distant views is developed! 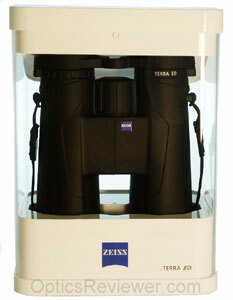 Zeiss makes a point of noting that the Terra ED binocular design uses the Schmidt-Pechan prism. We suppose this is noted to differentiate the Terra ED from the Zeiss model which uses the larger Abbe-König prism. The Schmidt-Pechan is a proven prism design which is used by many binocular companies in designing compact, lightweight roof prism binoculars. The Terra ED's field of view is quite good. We're strong proponents of a wide field of view and are appreciative of optics which seek to be above average in this respect. The 374ft (125m) field of view at 1,000 feet (1,000m) available with the 8X42 configuration calculates to a bit more than 7.1° angular field of view and we like it. The 10X42 configuration's 329ft (110m) field of view calculates to a nearly 6.3° angular field of view — not bad for a 10X magnification. We like being able to see activity in a broad viewing area, even if it's a bit fuzzy on the periphery and we need to swing the binocular to see a well-defined image in its "sweet spot"! What is often referred to as a binocular's "sweet spot" is that area in the center of the field of view which renders the details particularly well-resolved. That's the portion of the view in which you can also most clearly differentiate between shades of colors. It's understandable that birdwatchers, for whom much depends on being able to differentiate between color shades in identifying a bird. For the hunter, it's critical to be able to see differences in color tones to be able to see game hidden in a thicket or at a distance on the prairie or in the mountains. The resolution of details is enhanced above what would otherwise be possible by the use of extra-low dispersion (ED) glass for objective lenses. We say a bit more about the ED glass used by Zeiss in the next section where we discuss the Terra ED's rendering of colors. We found that the resolution of details by our test unit was comparable to other binoculars using ED glass for their objective lenses and having the bright view afforded by a generous number of layers of reflective dielectric coatings on the prisms. We don't want to get very far in talking about the Terra's very good resolution of details without giving due credit to its use of multiple layers of dielectric coatings on the binocular's prism. This enhances not only the low light viewing discussed below, but the brightness of view. Those who have read our reviews of other high-performance binoculars are no doubt familiar with the positive correlation between the increased brightness of view and increased resolution of details. A good, bright view and quality ED objective lenses complement each other in any binocular! Our test Terra ED binocular provided a good sweet spot. We were unable to discern any softening of the viewed image until about 64.3&percnt; of the radius from the center and it was still quite usable at that point. At about 78.6&percnt; of the radius from the field of view's center, the viewed image began to blur noticeably and become less usable. When actively looking for it, we noted a slight amount of pincushion distortion in our binocular's view. We expect that, as is customary with most quality binoculars, it was engineered into the optics to avoid the "rolling ball" distortion alternative that produces nausea for some binocular users. At this price point, one would expect the optics to be fully multicoated and the Terra ED's are, indeed, fully multicoated as well as being phase corrected. While using our test Terra ED in the field and comparing it to other binoculars at its price point, we did not notice that there was any optical color bias. 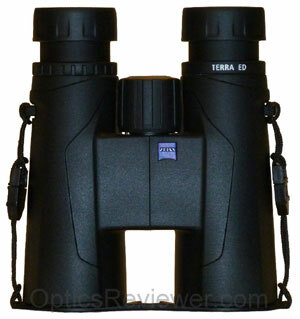 We are familiar with others feeling that there was a color bias in their Terra ED binoculars. We've looked through at least one Terra ED binocular which appeared to have a slight bias when compared to other binoculars. However, we didn't find that our test unit exhibited a discernable color bias. The contrast with our test binocular was excellent. Zeiss makes the Terra's objective lenses with Schott extra-low dispersion (ED) glass which we understand is made only in Germany. Schott is sometimes referred to as "a sister company in the Carl Zeiss foundation," so it might seem somewhat natural for Zeiss to be incorporating Schott's glass products into its binoculars. The optical contribution ED glass typically provides is to give a higher resolution of details, in large part by giving sharp distinction between colors instead of a somewhat blurred or fuzzy line at color changes without ED glass. This also tends to significantly reduce, but not typically eliminate, chromatic aberration. Chromatic aberration with the Terra ED seemed about average when viewing dead tree branches against a bright blue sky. We noted slight yellow fringing in the sweet spot, turning to a more reddish fringing in the periphery of the view. This was something we noted when looking specifically for it — it seems unlikely that it would bother most users. Our test unit seemed to perform as well as other binoculars at this price point which use ED glass for their objective lenses, however we did not perceive that there was a particular optical advantage to using ED glass manufactured by the Schott organization in either the Terra ED's color rendering or its resolution of details. We felt that this binocular performed very well under low-light conditions when compared with other binoculars at its price point. The Zeiss web site indicates that they apply in the neighborhood of 70 layers of reflective dielectric coatings to the Schmidt-Pechan prisms used in their binoculars. This agrees with the general principle of more dielectric coatings applied to roof prisms, within reason, will produce a greater optical benefit for greater resolution of details as well as enhancing low light performance. We found that we could use the Zeiss Terra ED binocular in very low light conditions and still be able to monitor the physical activity of a deer herd at the far side of a field, for example. One wouldn't expect to do much bird watching at that light level, but it can be useful, and is nearly always interesting, to see what a person's naked eye cannot see! When using our test binocular during sunrise or at sunset and viewing images or activity a low angles from the sun, we felt that the glare handling was above average for its price point and may even say it's exceptional at the price. Similarly, when using our test binocular at night and viewing bright parking lot lights, the amount of spiking was moderate and comparable to or above average for other binoculars at its price point. When we measured the close focus distance for our test unit, we found that we still had sharp resolution of details at 4.7ft (1.4m). Since our recommendation for bird watchers is for a close focus of about 8.0ft (2.4m) or less, this binocular will nicely fill the need for optics capable of capturing details at close-in distances. 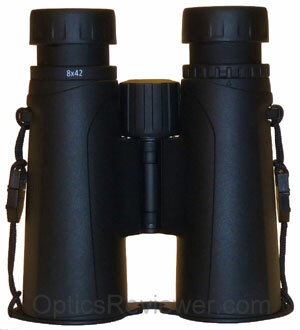 This compared favorably with the specified 5.3ft/1.6m close focus specification for the binocular. The depth of view, or three-dimensional effect, experienced when using the Zeiss Terra ED binocular is good. It is evident when changing the distance over which one is looking and not having to sharply readjust the binocular's focus. Porro prism binoculars provide an excellent three-dimensional view and it seems as though some roof prism binoculars simply don't have the 3-D effect. 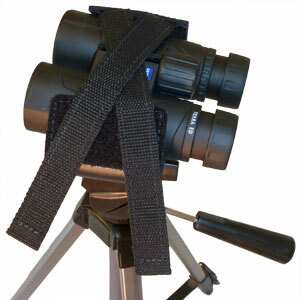 Our test binocular provided a view which, as a roof prism binocular, had good depth of view. The rain guard provided with the Terra is made of a rubber-like material which provides a enough friction against the eyecups to hold it comfortably in place. The guard is deep and flexible enough to fit well over the top of the eyecups and make a person feel good about it not coming off at a bad moment. The guard is relatively thin and made us wonder if it were made of particularly durable material. It feels as though it's a plasticized type of rubber and we're quite tempted to suppose that Zeiss would have tested it thoroughly at that thickness prior to using it with the Terra ED binoculars. Whether good or bad, we found ourselves using our Terra ED without its rain guard. Perhaps it was due to the design for how it attaches to the neck strap — the design is innovative, but effectively puts a friction brake to keep the guard from quickly sliding up or down the neck strap. This is good when it's been slid up and out of the way on the neck strap. It can be a bit frustrating when you're trying to get it off the eyecups and out of the way in a hurry, however. We found that the material that the objective lens cover soft and flexible enough to make it difficult to avoid flexing at the point between the binocular's barrels when the sides of the lens cover were pulled upward. That flexing tended to create a small gap between the lens cover and the binocular for us, so we just left the objective lens cover off and expected it would be a rare instance for rain or debris to fall on the objective lenses if the binocular were hanging from the user's neck. We like a number of the features we found on our test Terra ED binocular and we feel it has a focusing mechanism which is geared to avid birdwatchers, sports enthusiasts, hunters and others, with a good field of view, good low light capabilities and other higher performance characteristics. We feel it's a solid performer at its price point and it's kind of a bonus to have that little blue badge that says "Zeiss" on your binocular. 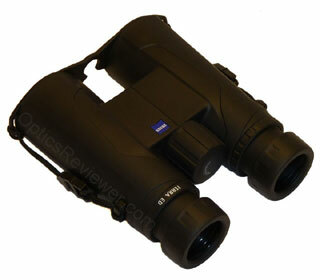 These links will take you directly to the Zeiss Terra ED binoculars listed on Amazon.com and Amazon.co.uk . We've found that it's pretty hard to beat the pricing and customer service at Amazon! Included with our Zeiss Terra were the rain guard and objective lens cover, a nice neoprene neck strap, micro-fiber lens cleaning cloth, instruction booklet, and a cloth carrying bag with drawstring made of a fabric with a soft feel on the outside. Zeiss sells a soft carrying case made for the Terra ED separately. As of the publication of this review, EagleOptics.com is offering that Zeiss carrying case as a freebie when you get your Terra ED binocular from them — which is a pretty good deal. We did not get a carrying case with the binocular we bought to test for this review. Because we wanted to know how they measured up against each other, we compared the Nikon Monarch 5 ED to the Zeiss Terra ED binocular — two binoculars at comparable price points. We're happy to share our thoughts with you through our comparison article: Zeiss vs Nikon. Zeiss says that the Terra ED binoculars sold in the United States and Canada are covered by the Zeiss Limited Lifetime Transferable Warranty. The Zeiss warranty for all other countries is a two-year manufacturer's warranty against manufacturing defects or faulty materials and covers the cost of labor and materials (this is in addition to the retailer's guarantee obligations). It's our understanding that if the serial number of your previously owned Zeiss binoculars shows that they were originally purchased new in the United States or Canada and you present them for warranty repair in the United States or Canada, they're covered under the Limited Lifetime Transferable Warranty no matter how many people owned them before you. (You can register your new and pre-owned Zeiss binoculars here www.zeiss.com. You'll only need your serial number and date you purchased any pre-owned Zeiss binoculars.) Of course, a transferrable warranty will result in a higher value if or when you sell your binocular.